If you’re like many people, you might have a favorable impression of coconut oil. Its shelf space has exploded in recent years. Because the oil comes from food grown on a tree and not from an animal, some people think it must be a healthier fat. But is it? And should you use it? As I tell my students, there are few absolutes in the world of nutrition. We’re individuals and must be treated as such. So, for some, the answer is yes and for others it is no. In some cases, the answer is maybe. It comes down to diet and lifestyle, health, genetics, and predisposition to certain health conditions. I have a client who is vegan. She eats no animal products and few saturated fats in her diet, so coconut oil might be a fine choice as adjunct to her olive oil. But for my client who enjoys a higher protein/higher fat way of eating and does not shy away from butter, bacon, and cheese, no, I wouldn’t recommend she use coconut oil. Saturated fats have no double bonds. With coconut oil, 92 percent of its fatty acids are saturated. Most of the good-fat foods we know—like olive oil, walnuts (and other nuts), avocado, seeds, salmon—are comprised of mostly monounsaturated and polyunsaturated fats. 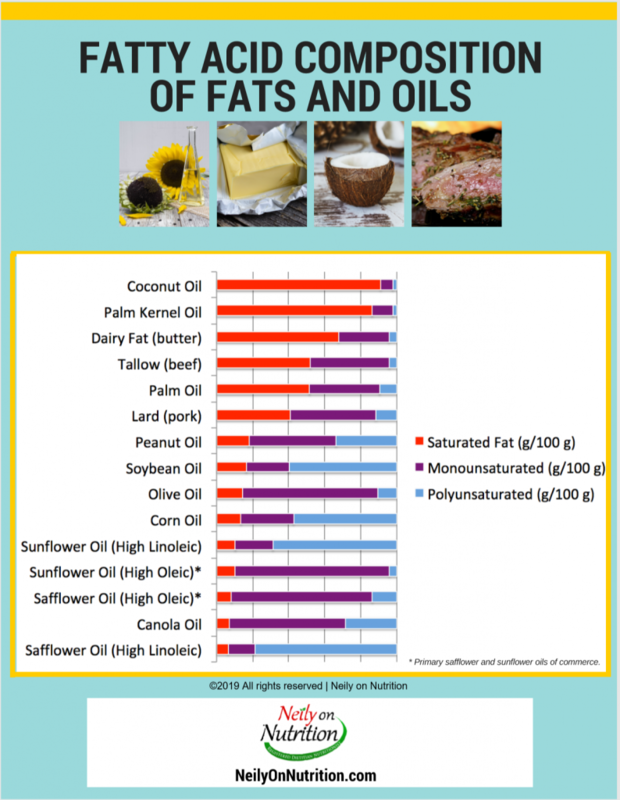 No food is 100 percent saturated or monounsaturated or polyunsaturated (see chart—Fatty Acid Composition of Fats and Oils). Saturated fat has long been considered a villain and implicated for increasing the risk of heart disease. Saturated fat is not as “bad” as once thought. As science progressed over the years, we’ve learned fats are not created equal, including saturated fats. There are arguments for both sides—those saying saturated fat is not a problem and those saying it is. Of the multitude of fats available, coconut oil is the most highly saturated—more so than butter, lard, and beef fat. 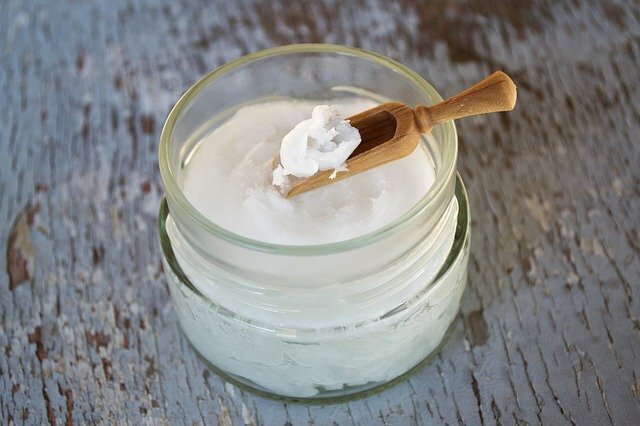 As a saturated fat, why is coconut oil considered healthy by some? The confusion is partly due to scientific research and marketing. Researchers use medium chain triglyceride oils, also known as MCT oils, in clinical studies. Popularity in coconut oil grew because it also contains medium chain fatty acids. But, coconut oil does not have the same composition of medium chains found in commercial MCT oils and those used in the research. More than 20 percent of the fats in coconut oil are long chain. To complicate it, the largest source of fatty acids found in coconuts called lauric acid acts unpredictably as either a medium chain or long chain fatty acid—often metabolized as a long chain fatty acid. Therefore not metabolized like its cousin MCTs. We can’t extrapolate that coconut oil acts the same way—or has the clinical benefits—of MCT oils. 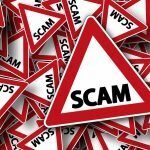 Assumptions made from marketing comparing the benefits of coconut oil to MCT oils are misleading and wrong. Much of the popularity is based upon the misleading assumptions of MCT oils. Coconut oil also soared in popularity with the rise of the ketogenic diet and plant-based diets. Well, let’s see. Do you have their genetic profile? Do you live in an environment that is similar? I suppose if you moved there, it’s a possibility. 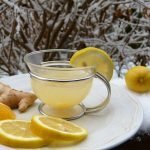 When I looked into the research, I found benefits from their use of the flesh of coconut and coconut cream (not processed coconut oil in a jar). Furthermore, their diet is unlike the standard American diet (SAD). They don’t have a fast food restaurant on every corner, nor are they exposed to highly manufactured food-like substances in the checkout aisle of every retail outlet (yet). It’s a different culture and environment—we cannot compare and make assumptions. There’s no way to know if other lifestyle factors contributed to the heart-healthy results. 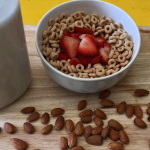 The first step is to watch your total daily saturated fat intake. All leading health organizations (worldwide) recommend less than 10 percent of total calories from saturated fats or about 20 grams per day. There are 13 grams of saturated fat per tablespoon of coconut oil. An often-recommended amount is 2 tablespoons per day, totaling 26 grams and exceeding recommendations. If planning to use coconut oil, consider the other saturated fats consumed. Next, look at your eating pattern. How are you eating? Are you eating lots of highly manufactured food-like substances or are you eating a more wholesome nutrient-rich diet inclusive of veggies, fruits, whole grains, and lean protein? What’s your physical activity level? What’s your cardio risk profile? What’s your genetic predisposition to health conditions (like cardiovascular disease and diabetes)? There are many factors. Lastly, know where you’re getting health news information. Is it a source selling coconut oil? A health organization? 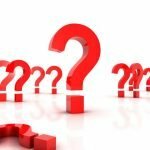 A blog by a medical or nutrition expert? A news site you trust? Disclosure: I have no vested interest in coconut oil or any oil. My goal is to provide unbiased, relevant health and nutrition information so you make educated decisions. You may be wondering…do I use coconut oil? I have it but rarely use it except for the infrequent Thai recipe. My preference is olive oil, and if I want a milder flavor—canola oil. On a wee occasion, I’ll use butter. Coconut oil like all oils (olive, sunflower, walnut, canola, etc.) has about 120 calories per tablespoon. It is a fat that’s solid at room temperature, made popular by marketing and unwarranted comparisons to MCT oil. It’s a highly saturated fat and when planned in an otherwise heart-healthy diet, okay for some but not for everyone. Keep your total saturated fat intake for the day (all food sources combined) to less than 10 percent of total calories (or about 20 grams per day). Enjoy coconut oil in moderation, so long as you don’t go coco-nutty with its use. P.S. 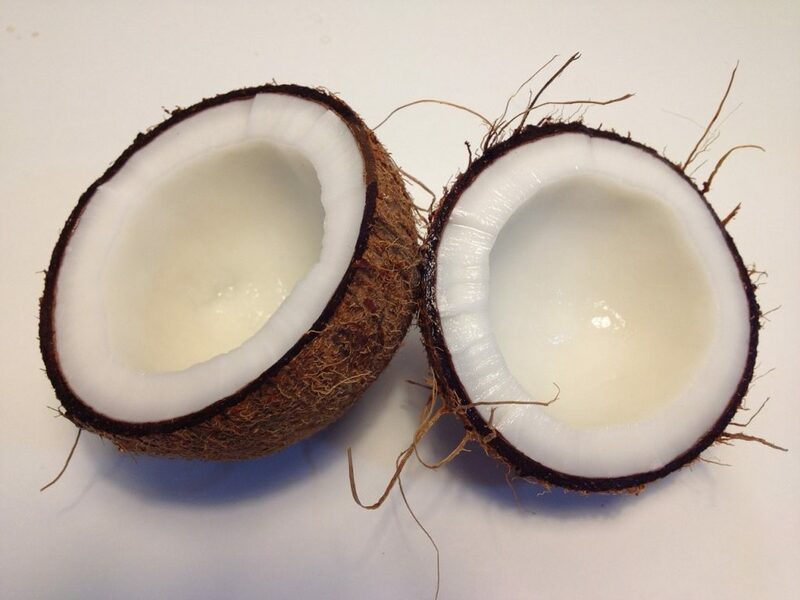 What about coconut oil used topically for hair or skin? Some research suggests it’s helpful so, sure. DeLany, James P., et al. “Differential oxidation of individual dietary fatty acids in humans–.” The American Journal of Clinical Nutrition 72.4 (2000): 905-911. Eyres, Laurence, et al. “Coconut oil consumption and cardiovascular risk factors in humans.” Nutrition reviews 74.4 (2016): 267-280. Fattore, Elena, and Elena Massa. “Dietary fats and cardiovascular health: a summary of the scientific evidence and current debate.” International journal of food sciences and nutrition (2018): 1-12. LaBarrie, Janna, and Marie-Pierre St-Onge. “A coconut oil-rich meal does not enhance thermogenesis compared to corn oil in a randomized trial in obese adolescents.” Insights in nutrition and metabolism 1.1 (2017): 30. Li, Yanping, et al. “Saturated fats compared with unsaturated fats and sources of carbohydrates in relation to risk of coronary heart disease: a prospective cohort study.” Journal of the American College of Cardiology 66.14 (2015): 1538-1548. Lockyer, S., and S. Stanner. “Coconut oil–a nutty idea?.” Nutrition Bulletin 41.1 (2016): 42-54. Mozaffarian, Dariush, Renata Micha, and Sarah Wallace. “Effects on coronary heart disease of increasing polyunsaturated fat in place of saturated fat: a systematic review and meta-analysis of randomized controlled trials.” PLoS medicine 7.3 (2010): e1000252. Nagao, Koji, and Teruyoshi Yanagita. “Medium-chain fatty acids: functional lipids for the prevention and treatment of the metabolic syndrome.” Pharmacological research 61.3 (2010): 208-212. Papamandjaris, Andrea A., Diane E. MacDougall, and Peter JH Jones. “Medium chain fatty acid metabolism and energy expenditure: obesity treatment implications.” Life sciences 62.14 (1998): 1203-1215. Rele, Aarti S., and R. B. Mohile. “Effect of mineral oil, sunflower oil, and coconut oil on prevention of hair damage.” Journal of cosmetic science 54.2 (2003): 175-192. Salter, A. M. “Dietary fatty acids and cardiovascular disease.” Animal 7.s1 (2013): 163-171. St-Onge, Marie-Pierre, and Aubrey Bosarge. “Weight-loss diet that includes consumption of medium-chain triacylglycerol oil leads to a greater rate of weight and fat mass loss than does olive oil–.” The American journal of clinical nutrition 87.3 (2008): 621-626. Wallace, Taylor C. “Health Effects of Coconut Oil—A Narrative Review of Current Evidence.” Journal of the American College of Nutrition (2018): 1-11. Thank you so much for this article! As a dietitian I have been concerned with the “health halo” recently surrounding coconut oil. Thanks for wanting clarification Mikaela! Yes, yes, yes to avocado oil. I CAN recommend it…coco oil…nope! Except topically. You will learn more in this week’s discussion board! On youtube I watch sarah’s day and she cooks with coconut oil and I thought that it was a good alternative for other oils. I personally don’t use it but there has been a great increase of people choosing coconut oil. I am a swim teacher so I do use coconut oil so, I won’t dry out. It works great for skin!